Since this is my first post since the tragedy in Newtown, I wanted to continue to send my thoughts and prayers to the familes who have suffered this tragic loss, and also to the most innocent among us that are no longer here. May the families find the peace and spiritual comfort they so desperately need. I enjoy Christmas decorating like many of you, but I decided to take a somewhat minimal approach to it this year. 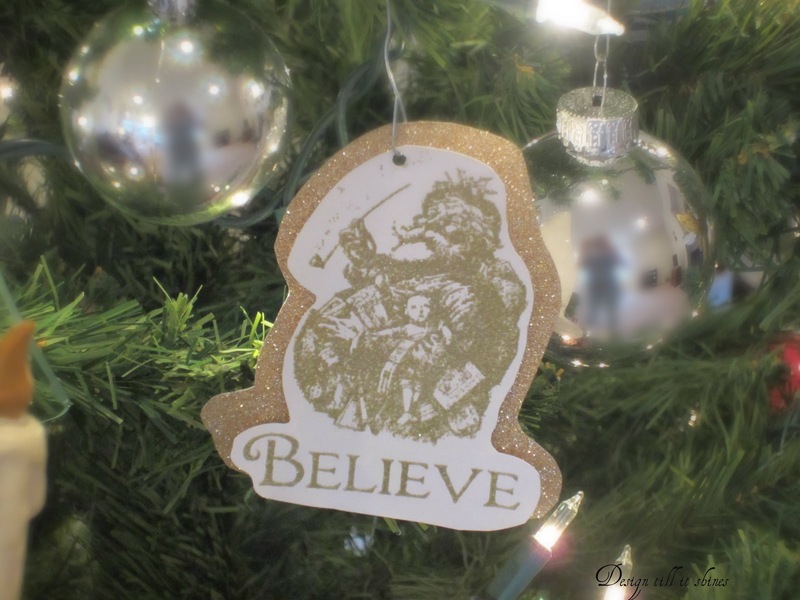 We have the same faux tree we have had for years and I added some papercraft items to it to create a different look. Even though we don't have a lot of decor for the holidays out this year, our feelings about Christmas remain the same. This corner does not have the best lighting, but it is the best location for our tree. 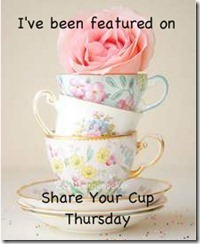 I also enjoy the beauty of the vintage table and the picture of the pioneer woman and young girl. I enjoy thinking about Christmas in a simpler time. 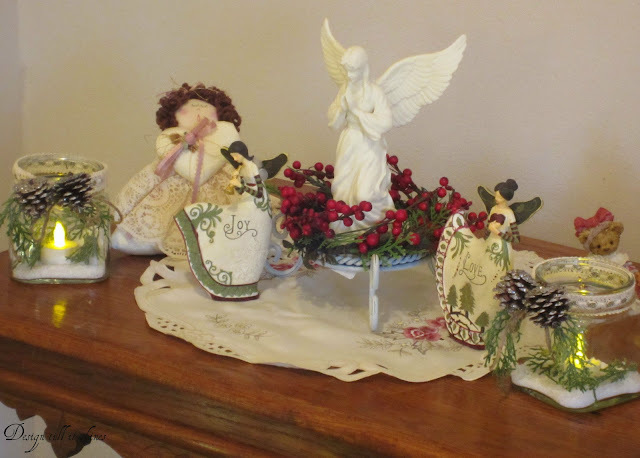 I inherited this table from my grandparents and I wanted to use some of my angel decorations for it. 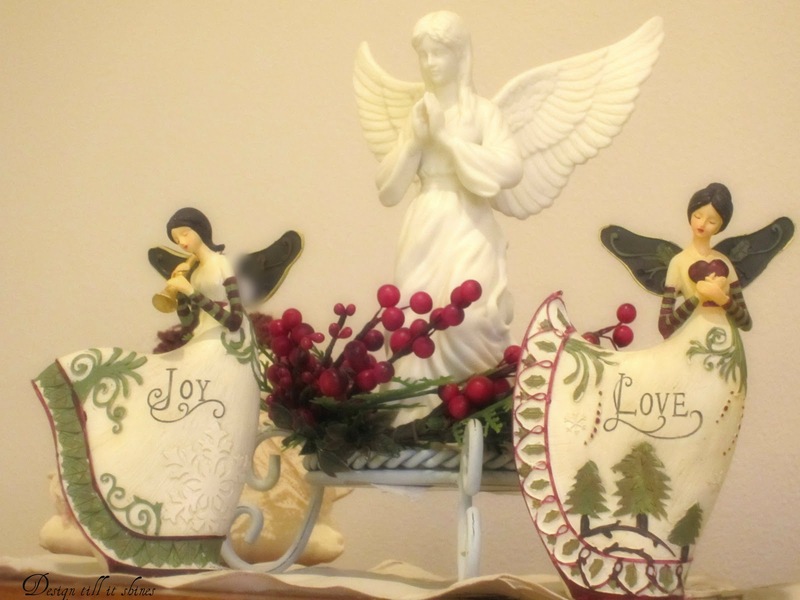 I found the two painted angels at a gift store several years ago and they have become some of my favorite Christmas decorations. 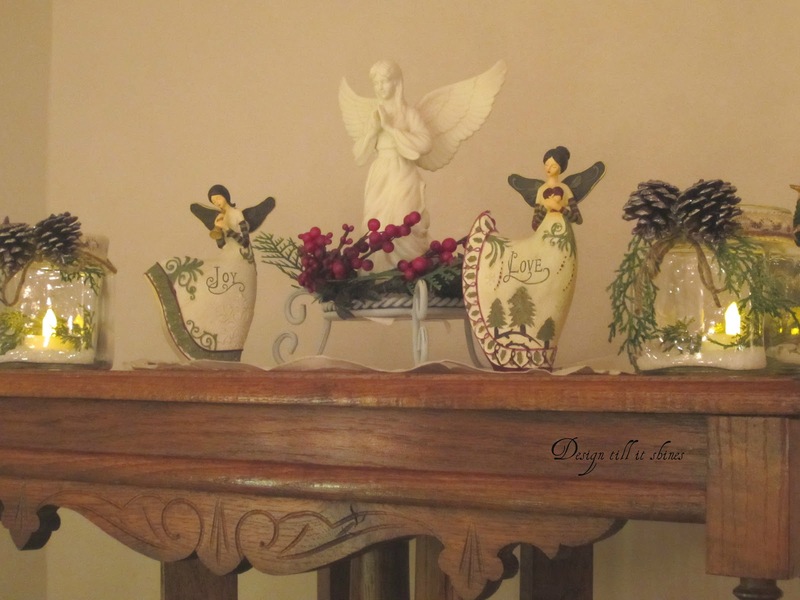 I also added a praying angel and some jar candles I made. I actually copied this idea from another blogger. I would like to give her credit but I don't recall where I saw this. 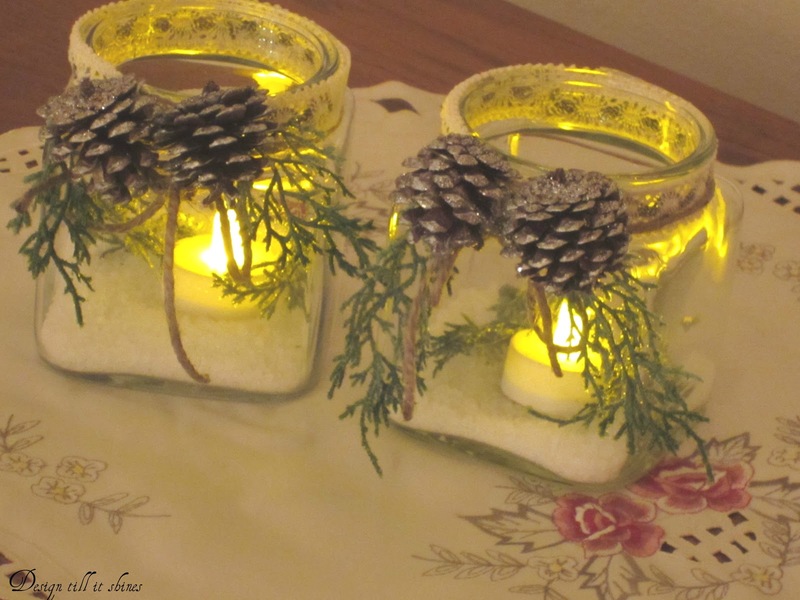 Mine is somewhat different because I used some small glass cannisters instead of jars and also used flameless candles. I glittered some pine cones and also added faux snow and cedar. I love the vintage look of these. I thought they would add a nice touch to my table. 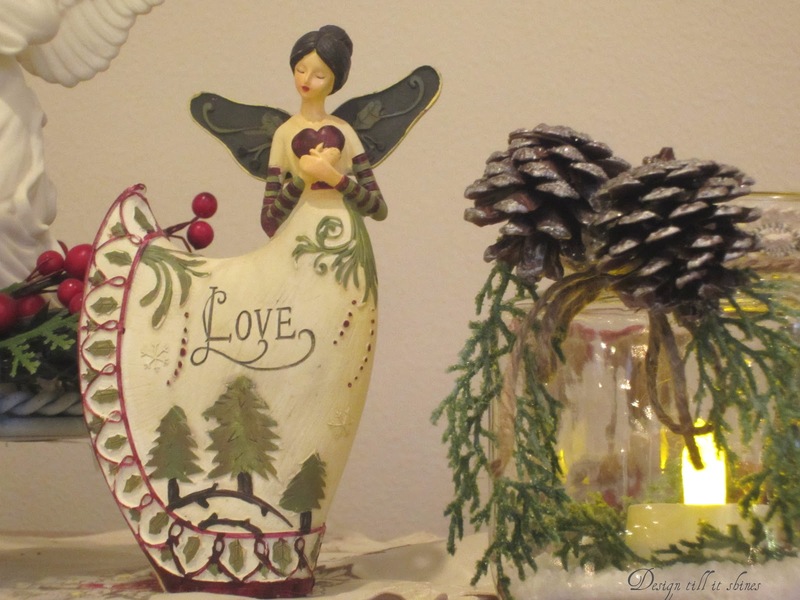 The simplicity of this decor says Christmas to me. I love the sweetness and beauty of angels. I wanted to share a nice close up of the angel. I love the detail on her wings as well. 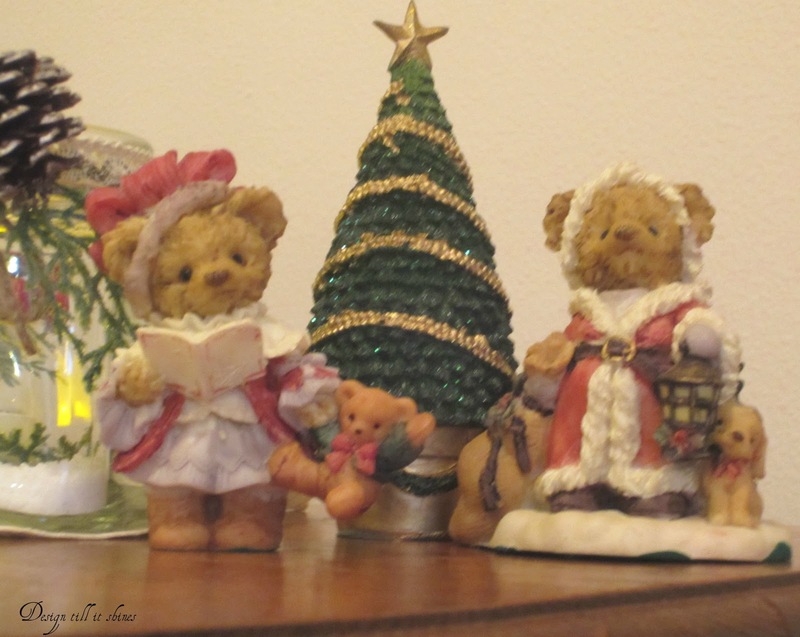 I also added my sweet little bears and their christmas tree. 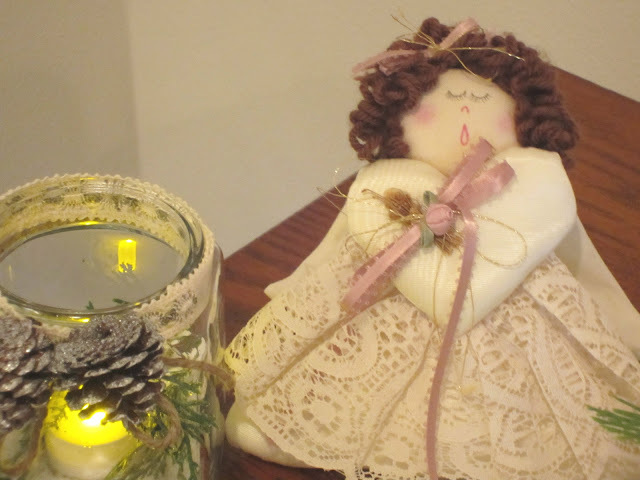 I received this singing angel years ago as a gift and I always enjoy displaying her. 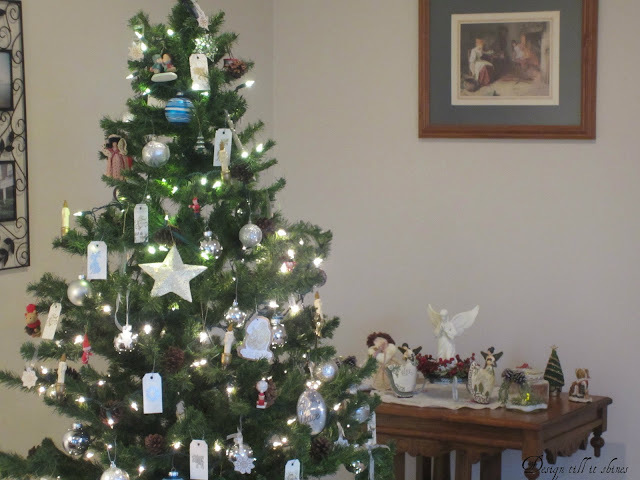 The tree is decked out with many of the same things we have used over the years. I enjoy our crystal star and usually put it close to the top of the tree. I usually make a tree topper but I didn't have time this year. I also added this angel tag. 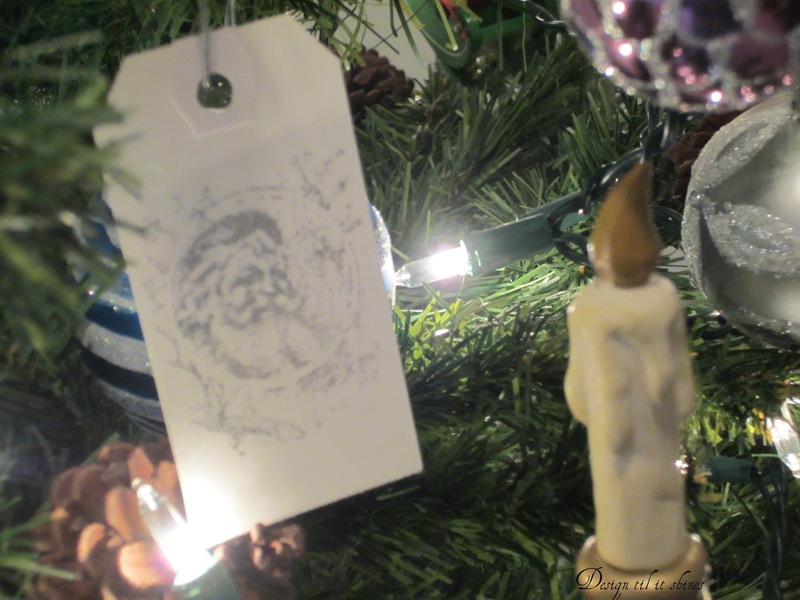 I used my santa stamps and added a littlewhimsy to the tree. 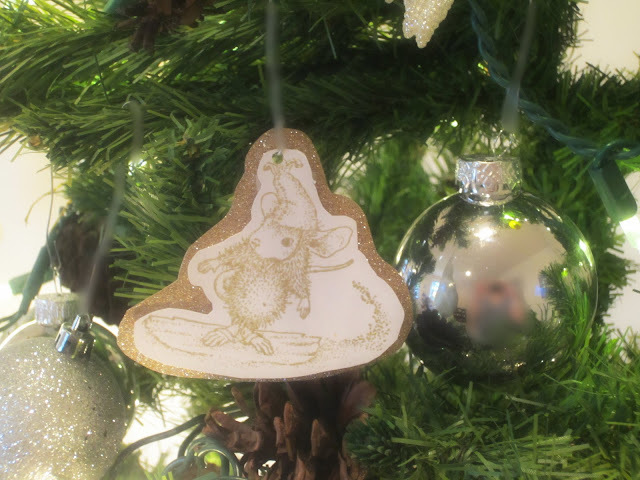 I have had this little mouse elf stamp for years and always enjoy making something with it. I also like my wooden candle clips that I add to the tips of the branches. I wish I had more of these. 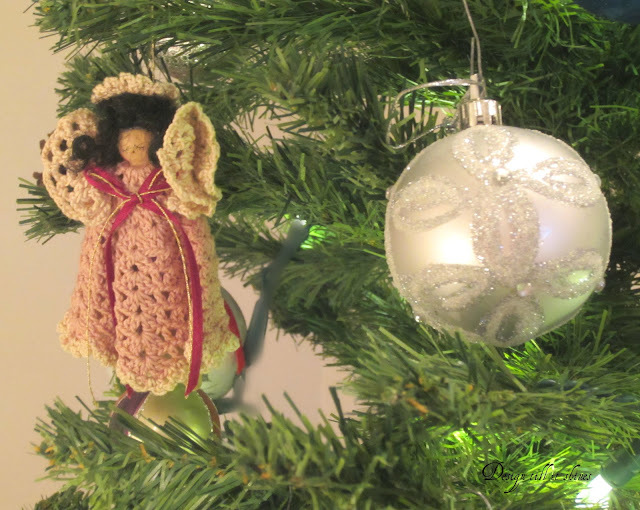 I always have to add my lace crocheted clothespin angel that I bought some time ago. 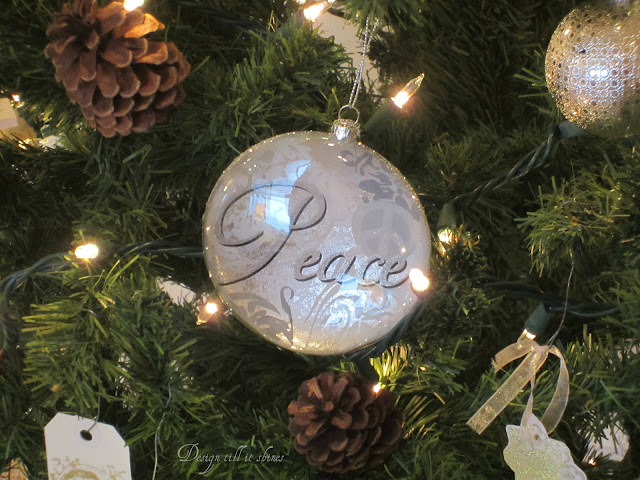 Just some special ornaments that I have on my tree and I can't think of a better time to pray for peace, than at Christmas. 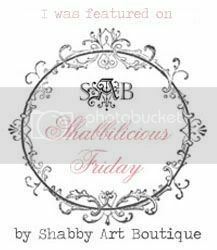 I will be sharing some outdoor religious themed displays soon so come back again! 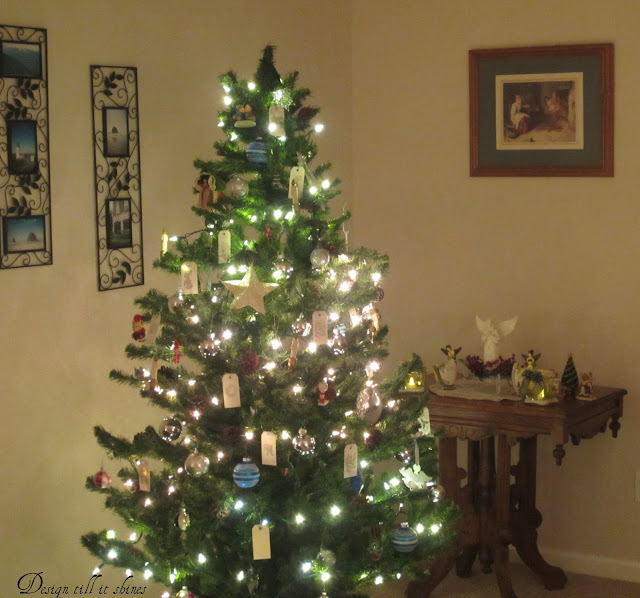 Diane--Your "simpler" Christmas is just so lovely! And, so festive! My Mom collected angels, too, and every Christmas she'd bring out boxes of them, so your post has brought back good memories. 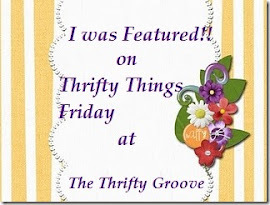 Thank you so much for sharing at our Country Whites Weekend. I'm so glad you joined in! Looking forward to seeing what you'll have for us next month! Your house looks all ready for Christmas! I hope you and yours have wonderful holidays! Your 'simple' version of Christmas has some really special touches. Your angels are really sweet. I'm your newest follower. 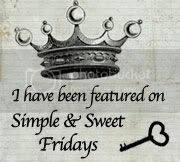 So happy that you joined us for Country Whites Weekend! Lovely Decor! I especially like your painted Angels,so very pretty!!! Beautiful! Your tree is so pretty! I hope you had a wonder Christmas!! Thank you so much for sharing at A Bouquet of Talent! 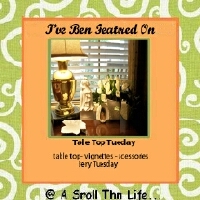 I featured your votives on Mod Mix Monday!